In May 2018 I discovered another Cast Iron monument that Garton & King can lay claim to having produced so I have added this latest discovery to the top of the list. I may yet discover others! 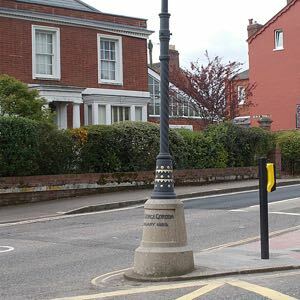 Any motorist or pedestrian in the Livery Dole area of Heavitree, Exeter must be familiar with the monument near St Claires Chapel at the junction with Heavitree Road, Fore Street Heavitree and Magdalen Road where is strategically placed what is known by most as the Gordon Lamp. It is here that on the small triangle of paving is a safe haven for pedestrians venturing to cross these always busy roads. 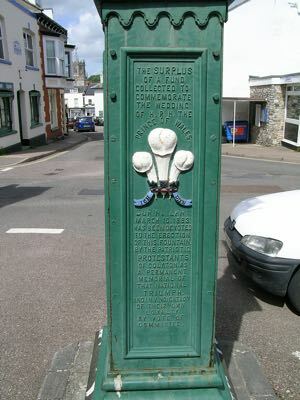 The history of the monument is displayed on a nearby plaque and much information is available on http://www.exetermemories.co.uk/em/_places/liverydole.php on Wikipedia and also on the Exeter Civic Society’s website. It was the Civic Society and others who were responsible for its restoration in 2015. 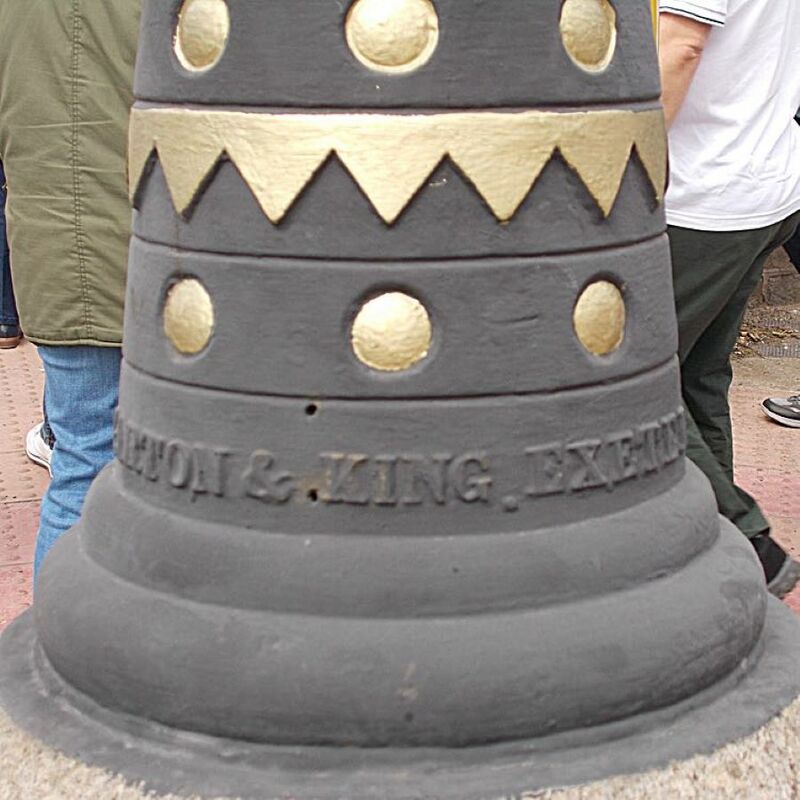 The Lamp Column itself is the most distinctive part of the memorial and up until the 18th May 2018 the manufacturer of the cast iron was completely ignored or overlooked by those who have put the history of this Memorial into print. I can now rectify this and proudly state it was cast by Garton & King at their Waterbeer Street Foundry just yards away from the Guildhall in 1884/1885 and plainly displays the words as shown in the image, GARTON & KING, EXETER. It was originally a Gas Lamp but like so many artefacts in Exeter the ‘modernists’ couldn’t resist getting their sticky fingers on it and the ‘T’ shaped ladder support has disappeared and it has had its Barley Twist column unceremoniously extended to raise the now electric light higher up in the air. Can’t ‘they’ ever leave anything alone without tampering with history, and a Monument to boot! Strangely, although the date on the granite plinth is the date of General Gordon’s death there is nothing I can find in local newspapers referring to the unveiling of the monument or indeed exactly when that was, so that little mystery remains. 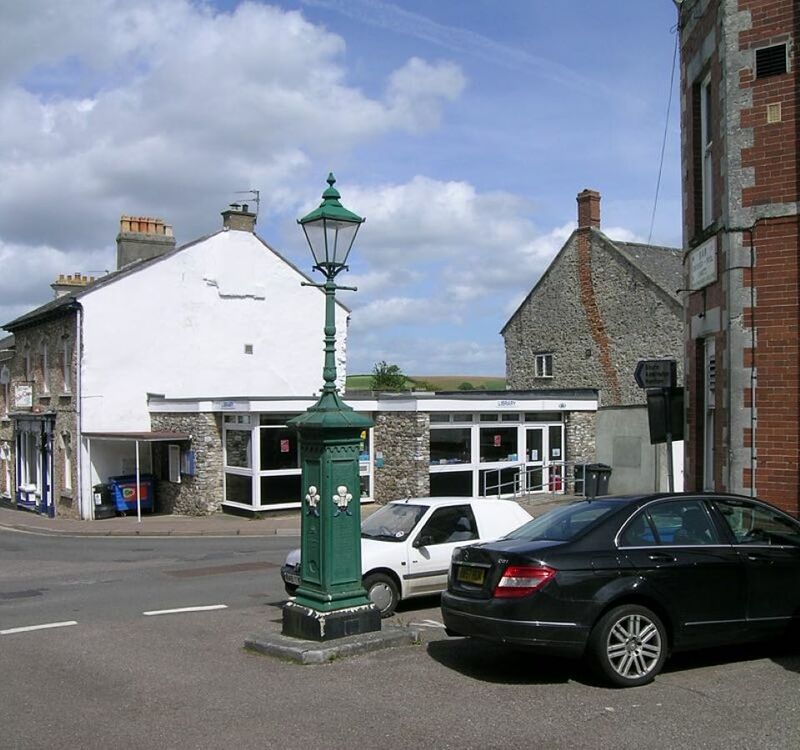 CHITTLEHAMPTON is a small village about 8 miles south east of Barnstaple and to the north east of Umberleigh. The principal feature of its large Main Square is the Decorative Water Pump on the South side. 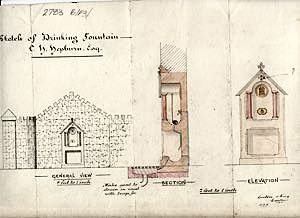 There is no date, even from the drawing that exists in the archives, so one cannot date it precisely but Garton and Jarvis was formed in around 1836 and became Garton & King in 1865. An article in the Village Newsletter may hopefully discover the reason why the Pump was commissioned and when and this information will be added later to this page. COLYTON in East Devon, a Devon mile north of Colyford and the A3052 boasts a fine Ornamental Fountain and Lamp located at the junction of Market Place, South Street, Queen Street and South Square. 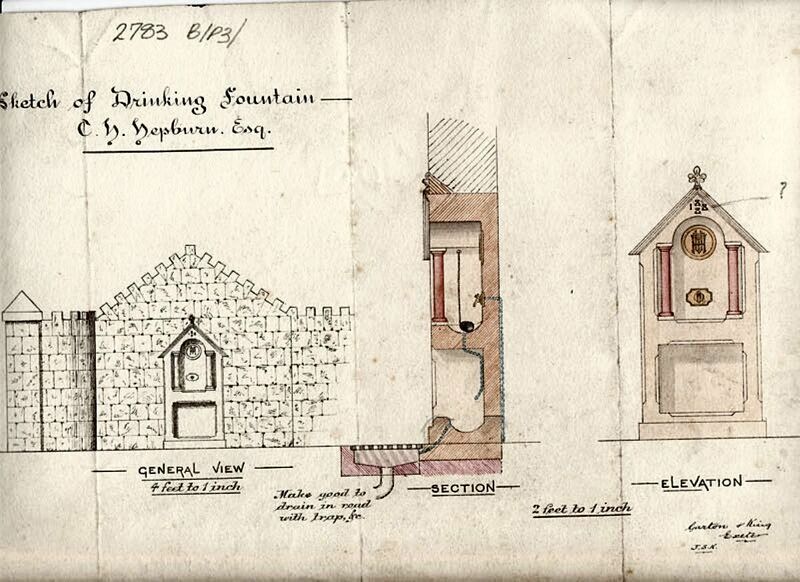 It was probably ordered and installed in the very early days of Garton & King (1865 onwards) though the monies for it were raised in March 1863 in the era of Garton & Jarvis so there's a degree of fluidity as to its precise date. 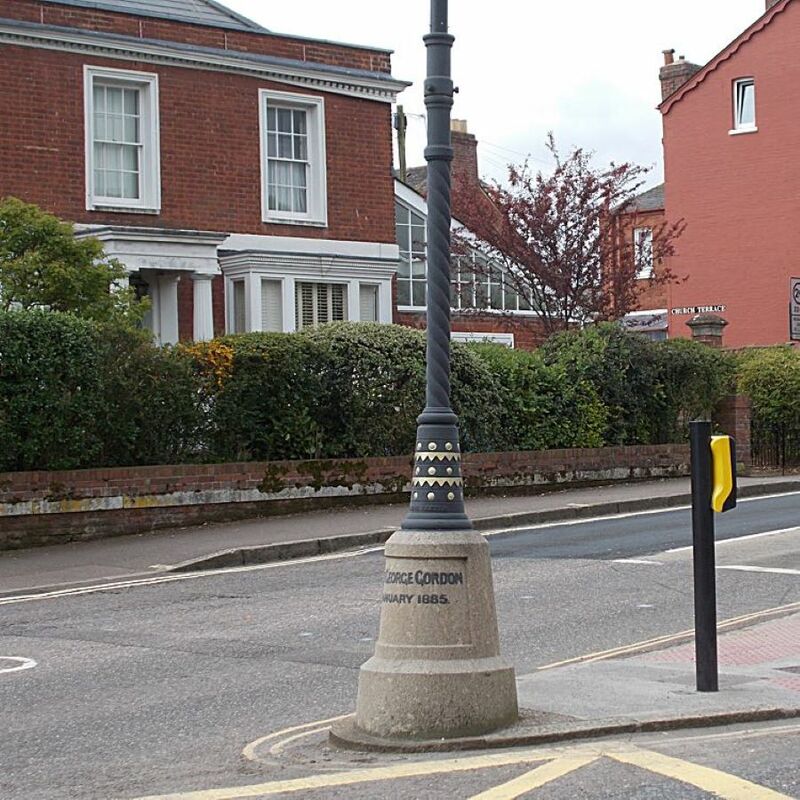 The lamp on top appears not to be part and parcel of the original fountain as it is secured in place by four straps and to my eyes looks somewhat unwieldy - I hope the lamp still works - perhaps some Colyton Resident will let me know, it's a shame the Fountain Portion doesn't. 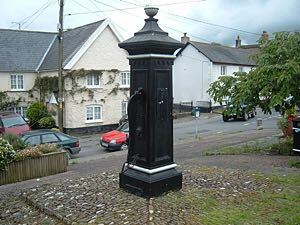 Should we blame South West Water for this I wonder - it seems that few operational Fountains, Village Pumps or even Horse Troughs survive in working order - certainly none of Exeter's Horse troughs do. 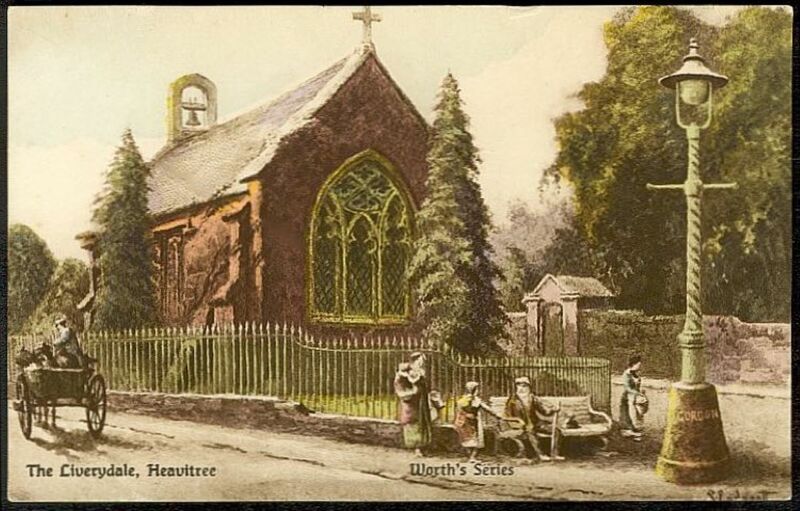 HELE PAPER MILL.The final Monument is again a Water Feature but unfortunately no longer exists but there are doubtless some that will remember it, perhaps a photograph of the Mill Entrance exists which may include it? Compilation drawing/photo courtsey of Warwick Knowles, Bradninch. Here is a drawing from the archives. It was erected by C Hepburn Esquire, of Dunmore House, Bradninch and onetime owner of Hele Paper Mill, possibly in 1888 and maybe to commemorate the death of H T Hepburn of that same year. The mock up image shows its probable location. It was removed in the 1960s - perhaps it ended up as a water feature in someone's garden - many a true word is spoken in jest - if it still exists I'd love to know as it obviously was a work of art as well as serving a useful purpose.